Art Club is known for making some of the best nail art polishes on the market. They're what you call 'striper' (not stripper, that's another post for another time) polishes. They're called that because they have a very long skinny brush instead of a normal polish brush and it's perfect for making stripes and other nail art. 3 Self-Stick Decal Sheets: Floral Decal, Heart Decal and Swirl Decal. They paid so much attention to detail on the packaging on this kit, it's absolutely beautiful. They even made a really pretty handle for it! The model for the advertisement has such amazing makeup, too. I never remember to take a picture of the advertisement. She has neon yellow and green eyeshadow with black double-winged liquid liner. Gorgeous, I'm going to steal that look this week. Anyway, there's the whole kit. Let's move on to the nail art. Anyone can do this nail art, it's not difficult. The only extra equipment required will be black polish and a dotting tool if you want to do the dots. I love the combination of neon and black, it reminds me of the 90's. The 90's rocked. One interesting thing about the charms- if you peel one of them off after your polish has dried, it will leave a flower-shaped hole in your polish. It almost looks intentional, pretty cool actually. Let's try another design with dots! A simple, bright look with a base of Color Club Volt of Light. Not colorful enough? Try adding more colors. This is neon pink and green, but it came out looking more like Christmas with snowflakes! So, hey, why not sport a Christmas manicure in April? This one used the Aqua Charms. Now here's something a little more involved. Marbling. It's really not difficult at all, you just need to work quickly because these neon colors dry very fast. Start with a base of a color you like and then add as many colors as you want to the nail. Take a toothpick or needle (I just used my small dotting tool) and swirl the colors around. And now that we've seen abstract, let's go back to something more geometric. In 1995 I had a coat that looked like this. I also had one that looked like this. I added one of the 'swirl' decals (looks more like a butterfly to me) to make it more interesting. I took these pictures while the polish was still wet, so please excuse the weird thickness of the polish. It goes away when it dries, I promise. I really love nail art. I wish I was able to do it more often! The Art Club striper polishes are perfect. The polish is opaque, it dries quickly and the brushes are just the right firmness. 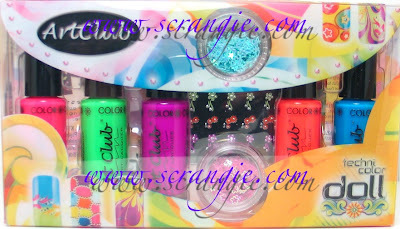 Since this kit contains neon polishes, you will need a topcoat if you want them to look shiny. I used Seche Vite, but I bet the Color Club Vivid Color Intensifying topcoat would work well on these too. 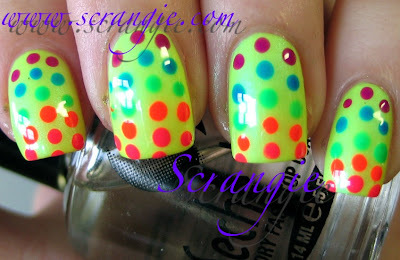 I love the neon dots!! 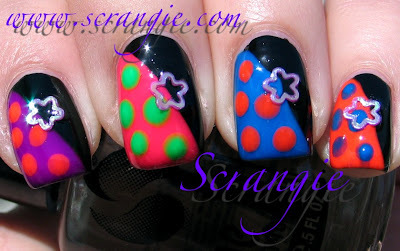 Scrangie you really rock girl for all that nail art! Thank you for so many ideas. I will definitely have to buy that kit. Where did you find it. Love the marbeling. Love all the color combinations. OMG...you are expert!!! Love the polka dots. You're killing me Scrangie!! :D I love AOT!! All of the looks you created are awesome! I have to hunt down this kit. I've been wanting some striper polishes, but I wasn't sure which ones to get. This kit takes the guesswork out it. pink-and-white acrylics = stripper polish, lol. Your manis reminded me of Cross Colours! For the geometric designs near the end, what was the name of the purple color? I love it, it looks a bit like parlez-vous OPI. I have a swatch of it at my blog! Oh those are sooooooooooooo cool!!!! Wow! Those are so inspiring and beautiful! I somehow think mine wouldn't look anything remotely like that, but you do make me want to try! Thanks for posting that. I love the watermark version the best!!! So free!!! And of course beautiful at the same time! 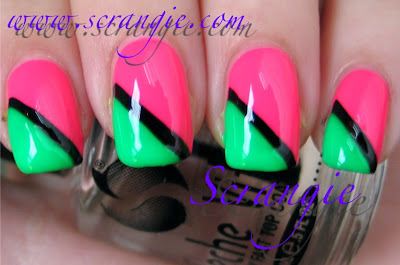 I like the half tone manis the black and neon go amazingly well together. I love that marbled look, I'm def. going to have to try that one. Im sorry..but LOL @ "They're what you call 'striper' (not stripper, that's another post for another time) polishes." I have been following your blog for a while and I have been very inspired by your gorgeous nails. 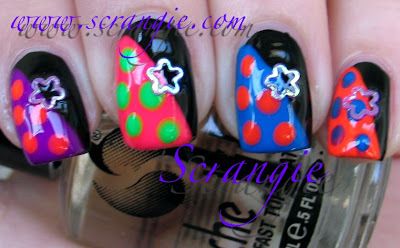 There is one thing...I am a complete lunkhead at nailart....particulary those flowered decal sets. I just bought a pack at Sally's and I haven't a clue what I should do...There are some big floweres, some small flowers and a few clusters of flowers. I am not sure if you like flowers but if there was a non-flower equivalent *with clusters and trails* do you think you could show a lunkhead like me the potential? I feel bad as this turned into a request *blush*. I saw some beautiful decals you did with the MAC peppermint patty polish (skull bones)so I was wondering if you have a lot of experience with decals. Wow, that's what I call colourful! You're really an expert in doing this! 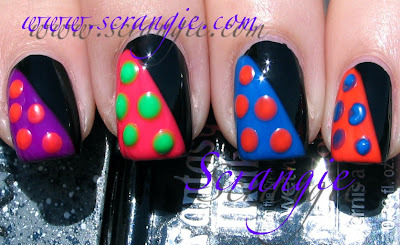 this takes me back to high school when I used Fabrege and Mary Quant polishes to create patterns and effects. I totally forgot until I saw this. 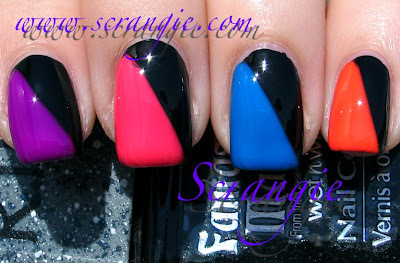 Fabrege had a kit of about 6 mini polishes which were unique in the late 60's; MQ had more shimmery pastels but in blue, green, purple which were "wild" back then! Hi Scrangie :) first of all I have to say how helpful (and fun!) your blog is. second, omgosh how do you keep from painting all outside of your nail? do you have like a nail guide that keeps the polish where you want it, because your swatches always look perfect (no polish on the cuticles and all). This is my favorite post EVER! I love everything about it from the pictures to the text to the tip color time machine. Yay! Your nail art rocked my socks! I might even get bold and try some myself! I love the first look. Diagonal 90's. Simple yet very stylish and fun! Also love the polka dots! Where would you get a nail kit like that online? I'm in the UK and I have no idea where to get decent polishes! Do you need a steady hand to do the diagonal ones? Woow, so bright!! Very nice! I'd love to see the make-up too! 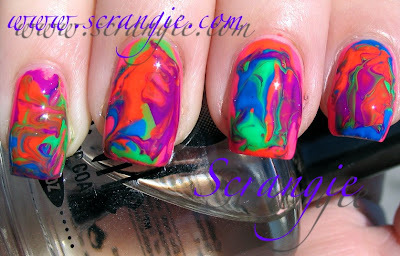 The marbling looks awesome on your nails, you let the base color dry before applying the others, right? And you apply the colors in stripes before swirling? 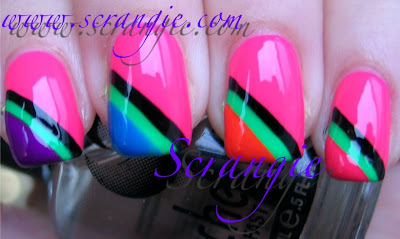 Love the funky neon nail art since I LOVE neon colours. Great ideas you've given me! You just made my day with this post! :) Thank you! 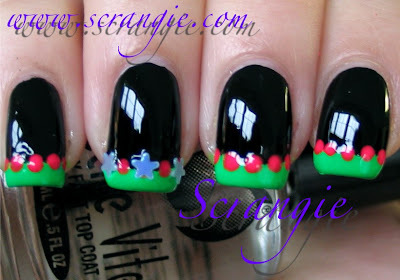 >< I'm a fan of your blog, but i'll have to say your nail designs are pretty awful. The ones with black, neon dots and flower stickers...downright scary. The marbling technique is also quite bad... it's a good idea to cruise through some japanese/korean nail design websites. Marbling is done best using a cup of water and toothpicks, not big messy splotches on your fingers. Alexlyndra, thank you :) I think 8ty8 is just down in general, they got swamped with orders and had to close to catch up! Polish Earthgirl, it's the neon purple from the kit, Paisley Paradise! It doesn't really look anything like Parlez-Vous OPI in real life though! Mary, try it! It's really, really easy. Faith, it's so easy, definitely try it! Hatwood, awe thank you! No, I don't have a guide, just a lot of experience painting my nails :) You'll learn not to polish your cuticles with practice! HoneyHoneyNY, DO IT!!! You could totally rock it!! Nathalie, thank you :) It was fun! Megan, oh my, you must visit Head2Toebeauty.com and 8ty8beauty.com! Penny, haha, awwwe, thank you dear! Don't listen to Carly, Scrangie! I really like your designs. My roommate and I LOVE your marbling, and plan to try it soon. 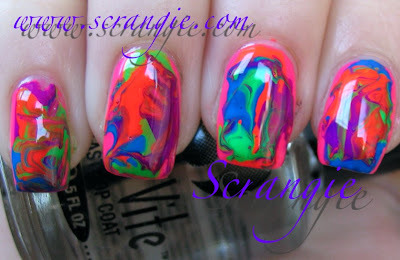 I also looked at other websites for marbling and found that many choose to do it directly on the nail. Don't listen to carly, scrangie. You are far more creative than I am. I have some Konad pens I am trying to figure out what do with right now. I like the look with the dots just on the backside next to the cuticles. *shrug* I call it as I see it. If something looks awful, I'm not afraid to say something about it, especially since this is a high traffic blog where each post is seen by thousands. And it's quite funny how suddenly so many commentors assume i "don't like myself". How does criticizing awful nail design suddenly become psycho-analysis? I've seen my share of professionally done nail design to distinguish between ones of good taste and one that's done badly and crudely. Learn to take criticism better, every single one of you that made a reference to my comment. "People who do that usually are doing that to make themselves feel better" That comment really makes me laugh. I'm just an anonymous poster criticizing nail design that I personally think could use improvment. And no, criticizing the designs don't do anything in particular for me, however, seeing better nail design posts probably would. Carly, there is a difference between constructive criticism and mean criticism. Constructive criticism is when you would say something like "I think your nail art could be better, and these are some pointers I can give you." Mean criticism is using words like "awful, scary, and quite bad." Those are negative words with vague connotations that don't specifically say to the recipient what can be done to improve. Your responses to the other posters who criticized you is to demean and belittle them. I can't imagine why you think that this is a constructive use of your time. Why am I posting this? Well, I am tired of people like you who use mean criticism. If you learn from this, then great. If not, then perhaps you should stop reading this blog if what you see bothers you so much. Many of us do appreciate Scrangie's work, and if we don't like something, know how to say so without hurting her feelings. Calling things like you see them makes you a narcissist, not a hero, because you are only concerned about your perspective. Why don't you start your own blog to show us how it is done? I for one will not come to visit. Summer Colors from Sephora by OPI!